Through our 40 years in business, we've come across basically every camera ever made. And while our staff tries to stay neutral on the subject and not play favorites, we often get into spirited arguments about which camera is the greatest of all time (a.k.a., the GOAT). This got us thinking it was time to open up the competition and settle some scores in the public arena. 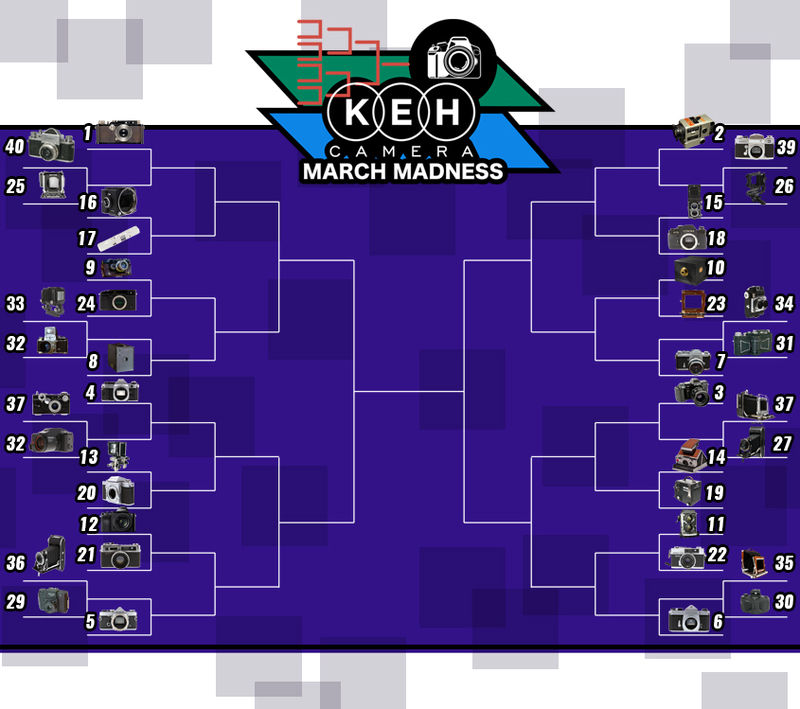 That's why this month we're sending camera fanboys into a frenzy by launching the ultimate photography showdown—a KEH Camera March Madness, if you will. We held our own Selection Sunday, and out of thousands of eligible contenders, a field of 40 cameras (one for each of our 40 years in business) came into focus—and the competition is looking fierce. Complete with four regions, seeding by rank and play-in games, we went all out to determine our champion—and you get to decide who will ultimately cut down the nets. There's plenty of familiar faces on the bracket, but we also opened the door to a few long-shots looking to become Cinderellas. Each brand gets a chance at eternal life with one of their legendary models. These are our top seeds—true giants—but the bigger they are, the harder they fall. Could these favorites be prone for an upset? 1. Leica IIIf: Smaller, lighter and quieter than later M-series rangefinders, this Leica is a true MVP—when it came out in 1933, it sold for what would be nearly $4,000 of today's money, yet, demand was so high it was backordered for two years. 2. Hasselblad 500EL Data Camera: Basically a modified 500C, this superstar was the first camera used on the moon and is responsible for truly out-of-this-world photographs. 3. Nikon F: Nikon's first SLR camera was the most advanced photography tool of its day. Released in 1959, the F became extremely popular and put Japan on the map as a heavy hitter in the industry. 4. 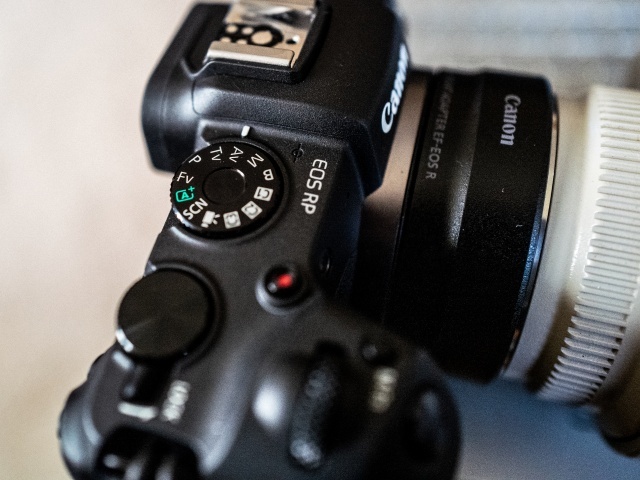 Canon AE-1 Program: Coming on strong in 1981, this camera brought program mode to the masses—with it, all you had to do was point/focus/shoot and the camera did the rest. These contenders are no slouches—any one of these cameras can hold its own. And in single elimination, anything can happen. 5. Olympus OM-1 MD: This sharpshooter offers mechanical precision and big system performance in a compact body. 6. Pentax Spotmatic: A true innovator—the first SLR to offer a through-the-lens exposure metering system. 7. 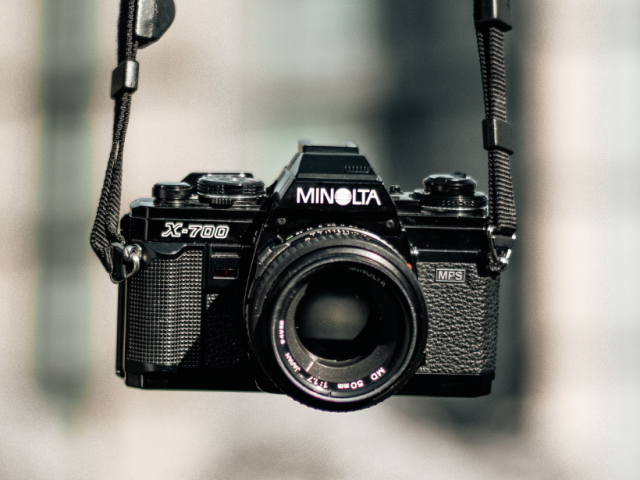 Minolta Maxxum 7000: Forward-looking in 1985, it was the first SLR to feature both autofocus and motorized film advance. 8. Kodak Brownie 2: This old-timer introduced the concept of the snapshot all the way back in 1900 and might've single-handedly popularized photography. 9. Zeiss Ikon Contax I: An early Leica competitor, 1932's Contax I was in many ways the superior German rangefinder. 10. Susse Freres Daguerreotype: The O.G.—coming out of France in the late 1830s, this was one of the first two cameras ever sold to the public. 11. Mamiya C220: A light-weight interchangeable lens TLR with bellows that allow close-focusing—an all-around complete package. 12. Sony A7: The first full-frame interchangeable-lens mirrorless camera—introduced in 2013, it marked the beginning of the end for DSLRs. 13. Sinar P 4x5: The P is for "perfection" in this large format beast—introduced in 1970, it set the standard for high-end, pro cameras. 14. Polaroid SX70: This folding SLR has a sophisticated design and is an absolute favorite amongst instant film aficionados. 15. Rollei Rolleiflex Automat: This medium format TLR took the grand prize at the Paris World's Fair in 1937 and it's been winning fans ever since. 16. Bronica ETR: The addition of a leaf shutter made this a dependable studio workhorse which could flash sync at any shutter speed. 17. Minox C: Small but mighty—this subminiature espionage camera is a piece of Cold War history that’s still amazing today. 18. Contax RTS: Manufactured by Yashica, these SLRs became very popular partly because of the excellent line of Zeiss lenses available for the system. 19. Graflex Super D: A very popular large format camera, used from the late '40s all the way to the '60s for portraits, documentary and editorial work. 20. Topcon RE Super: This professional SLR came with a comprehensive range of accessories for maximum versatility and customization. 21. Yashica Electro 35: An iconic rangefinder, developed for the masses in the mid-1960s, featuring aperture-priority automatic shooting. 22. Konica C35: A simple-to-use compact camera with an excellent lens and good looks—it's a winner. 23. Wista Field 45: These Japanese wood-and-brass-bodied field cameras are both stunningly beautiful and a pleasure to play with. 24. Fujifilm X-Pro-1: This handsome rangefinder-style, interchangeable-lens digital camera incorporates a hybrid optical/digital viewfinder. These scrappy cameras have a tough road ahead of them, but they’ll fight their hearts out where it matters—on the court. 25. Linhof Super Technika V: Rangefinder-style focusing with back-tilt capability makes this a versatile two-way player. 26. Horseman 450: A 4x5 monorail camera renowned for its flexibility of use. 27. Voigtlander Bessa I: This foldable classic was in production for a decade starting in the late 1940s. 28. Chinon Genesis: The original 35-80mm zoom that helped define the modern bridge camera. 29. Holga 120S: Lo-fi but highly regarded, this medium format camera embraces the plastic/fantastic aesthetic. 30. Noblex 135: These amazing rotating-lens panoramic cameras produce photos with a 127° angle of view on standard 35mm film. 31. Panon Widelux F7: A fully mechanical swing-lens panoramic camera that NASA has used for the awesome 140° coverage. 32. Kine Exakta 1: Sporting a fixed waist-level viewfinder, this camera came equipped with great optics. 33. Arca Swiss 2x3 F-line: This fully-modular system monorail camera is portable and incredibly precise. 34. Industria Scientifica Super Duplex 120: This dual-lens camera creates fun stereo images on 120 film. 35. Deardorf 8x10: A massive floor-standing studio camera made of mahogany, brass and aluminum—built to last. 36. Agfa-Ansco Viking: This 6x9 medium format camera was highly portable thanks to its foldable design. 37. Argus C3: This brick-shaped rangefinder was affordable and rugged, making it a popular choice for war photographers. 38. Busch Pressman Model D: A popular press camera in the '50s and '60s due to the wide number of lenses available for the system. 39. 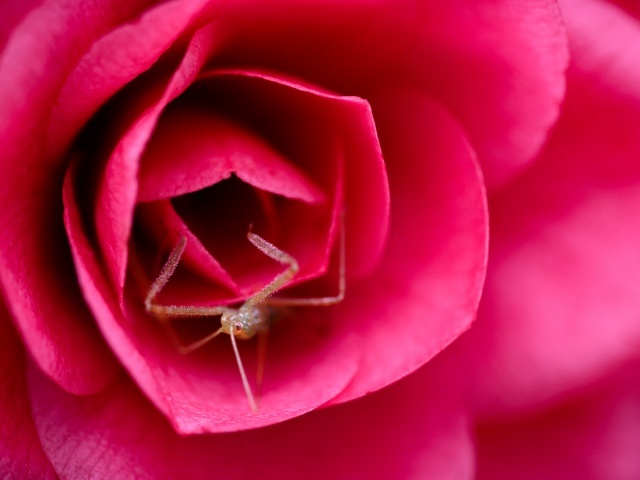 Miranda Sensorex II: This quirky SLR has its shutter button on the face of the camera, making for a stable shooter. 40. Zenit S: This Soviet-era underdog is a Leica III copy with a ground-glass screen and prism instead of the original rangefinder. Follow us on Instagram starting today and check our stories for multiple daily matches. Vote for your favorite in every match and the winners move up the bracket until one champion is crowned. Plus, participation gets you entered to win fun prizes! We'll announce the winners as the tournament goes along, so make sure to check our Instagram and this blog for updates in the near future.